Sig. 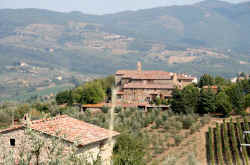 Ballini produces a Chianti Classico and two table wines, a red and a white, which can be bought by measure, as well as a Vin Santo. 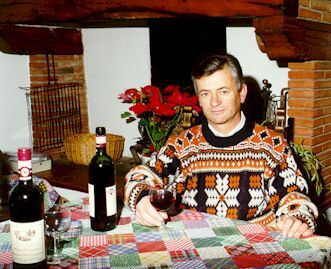 He also produces small quantities of a wine, unique in Tuscany, composed of 100% Cabernet Franc. Excellent olive oil is also available. Wine and olive oil can be purchased directly from Sig. 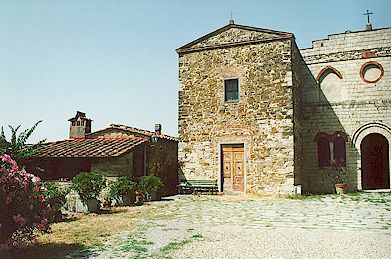 Ballini on Wednesday and Saturday afternoons (2 pm to 7 pm) at his house next to the parish church of San Cresci (map) near Greve in Chianti. A visit to the San Cresci farm provides an inside view of the traditional rural life of Chianti in one of the most beautiful settings in the area. The Ballini family have lived for more than one hundred years (Ballini genealogy) in the farm houses clustered around the recently restored, Romanesque parish church (Pieve) of San Cresci which dates from the 10th century. Traditional wine-making equipment can be seen while tasting the excellent wines.